Hey guys, I'm kinda swamped for time right now since I should be studying so I'll quickly rifle out a post. I went to the Cocheco this morning for about an hour and a half. I had heard good reports of a caddis hatch coming off and nice holdover fish being caught and so, I wanted to try to see if I could build off my last successful trip out. Unfortunately, the fish did not cooperate in the hour and a half that I was there. The temperature was a little on the cold side but reasonable and the flows were perfect but I couldn't make anything happen. Didn't see any fish rising so I deduced they were feeding on nymphs (unfortunately none of mine!). I fished the same pool I fished in the previous trip as well as a couple other spots before heading up to the big pool. Since there was already someone fishing the run at the head of it, I decided to pack up and head elsewhere instead of crowding him out. I pulled up the stocking report and found out that my favorite regional freestone had been stocked last week so I decided to head there and try to catch a few fish instead of beating up the water where I was. It turned out to be the correct move! Things started off a little slow as I was fishing a nice pool that gets stocked heavily. The first 15 minutes or so, I went bite less as I was working up from the tail out to the head of the pool. Usually when there are fish, they stack up in the tail end so I was getting a little worried that they may have been fished out already. However, when I got to the fast water at the head, my indicator jumped upstream with such vigor that not even the most distracted fisherman would miss it. I soon pulled out a nice bow on a hare's ear. After pulling out this fish, I was not too surprised to find the next few fish stacked up in the fast water. 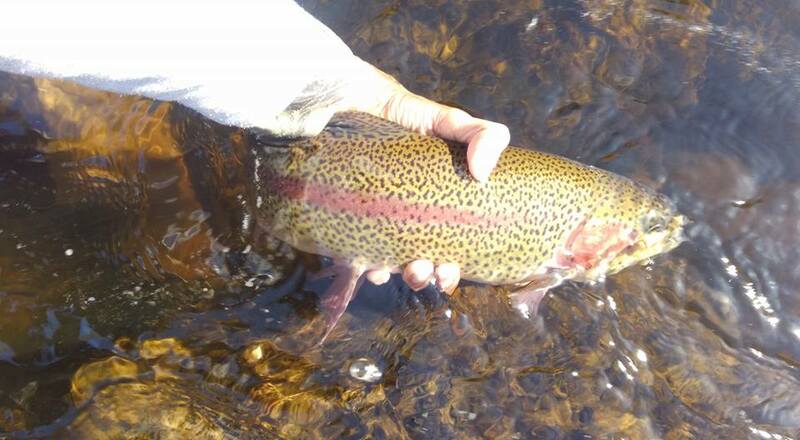 I caught 4 bows and a nice fallfish on wooly bugger and missed a few more including a couple further upstream. Having fished this place last year and catching mostly brookies at the tail end and middle of the pool, it was interesting to see that the bows were stacking up in the fast water. I left soon after a couple locals pulled up and started fishing there. They were very nice and respectful fisherman and I hope they got a couple as soon as I worked upstream. On a side note, the black flies have moved in and were BAD on this stream. Could not have asked for a better day to come out and enjoy nature! I can't wait until finals are over so I'll be able to enjoy more days out before work starts.